Celestron C8 NexStar OTA. Illustration courtesy of Stellarvue. Celestron is a company located in Torrance, California that was purchased by Synta Technologies of Red China in 2005. The main components of C8 telescopes are now fabricated, figured and assembled in China. Celestron quality checks C8's after their arrival in the U.S., before they are sent to dealers. There are several modern C8 packages. The C8 with Starbright XLT coatings reviewed here is an advanced level telescope and the lineal descendant of the original C8 that made Celestron's reputation. It is sold as a basic optical tube assembly (OTA) without mount, or as a complete telescope system with a variety of mountings. Contemporary C8 Starbright XLT aluminum main tubes can have an orange-bronze pearl, gray, or gloss black finish, depending on the mount with which they are supplied. The front and rear cells are charcoal black. The basic OTA (without any mounting system), as illustrated on the Celestron web site, sports a gray main tube. Available mounting systems include the NexStar SE single fork mount (ornage-bronze main tube), CPC dual fork mount, CGEM German Equatorial mount, or CG-5 German Equatorial mount. (Supplied with black main tubes.) In 2010, a special Limited Edition version with a carbon fiber main tube was offered on the CPC fork mount. All of these mounts are of the computerized, go-to type, but regardless of the mounting system and main tube color, optically and mechanically all C8 Starbright XLT telescopes are the same. In addition to the standard C8 Starbright XLT optical system, Celestron also offers an 8" EdgeHD optical system, either as an OTA or with a heavy duty German Equatorial mounting system. Edge HD scopes come with cream colored optical tubes and their optics are not the same as other C8's, although they remain 8", 2032mm, f/10 scopes. They feature a new aplanatic Schmidt-Cassegrain optical system with a Schott glass corrector/field flattener in the central baffle tube, Fastar (removable) secondary mirror, flexible mirror support rods with tension clutches and tube vents to assist temperature stabilization. We hope to cover an EdgeHD telescope in a future review. "Fastar F/2 Imaging or Hyperstar Setup on a Schmidt-Cassegrain Telescope requires mounting a CCD camera and lens assembly where the secondary mirror of a Schmidt-Cassegrain telescope is located. The key advantage of this configuration is the fast exposure time. At the f/2 focal ratio exposure times are 25 times faster than at f/10 and require only 20-30 seconds to capture many deep sky objects. Because the exposure time is so low there is no need for guiding or polar alignment. A word of warning, not all Schmidt-Cassegrain telescopes are Fastar or Hyperstar compatible. 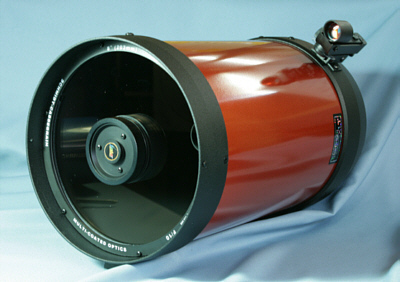 A compatible Schmidt-Cessegrain or EdgeHD Telescope, F/2 lens assembly (Starizona.com), CCD Camera, Image Processing Software (may or may not be bundled with CCD camera) and Laptop Computer are essential equipment." We recommend that you not attempt to remove the secondary mirror unless you are actually going to use a Fastar imaging system. Never mess with the optical system unless it absolutely cannot be avoided. Not being fans of go-to mounts and with suitable manual mounts on hand, we ordered our C8 Starbright XLT as a NexStar OTA (CE8SEOTA) from our friends at Stellarvue. Stellarvue, in addition to manufacturing their own superb apochromatic refractors, is a Celestron partner and Stellarvue refractors are now available with Celestron go-to German Equatorial mounts. This OTA had been used by Stellarvue in a display and features an orange-bronze main tube, rather than the gray OTA sold as the C8-A XLT. As described by Stellarvue, "This is a new OTA that was shown only once on display and is in perfect condition. It comes with a full length Vixen sized rail, Stellarvue F1001 red dot finderscope, 1.25" eyepiece holder and Celestron 25 mm eyepiece." The red dot finderscope replaces the hard to use, 6x30mm, straight-through/inverted image optical finderscope supplied with most C8 optical tubes. The telescope's notable features include a seamless aluminum optical tube with aluminum front and rear cells, a white water glass Schmidt corrector lens and Starbright XLT optical coatings on the corrector and both mirrors. As with all conventional Schmidt-Cassegrains, the curvature of both the primary and secondary mirrors are segments of a sphere, coma correction being provided entirely by the big aspheric Schmidt lens that seals the front of the optical tube and to which the secondary mirror is mounted. Collimation adjustment screws are provided for the secondary mirror and the Owner's Manual offers clear, easy to follow, collimation instructions. This is an 8" (203.2mm) clear aperture, 2032mm prime focal length, f/10, Schmidt-Cassegrain telescope (SCT). The f/10 to f/11 focal ratio range represents a sort of "sweet spot" for general purpose, Schmidt-Cassegrain astronomical telescopes. It offers an adequate f/stop for photography, while minimizing the size of the secondary obstruction and its deleterious effect on image quality. Celestron's C5, C6, C8, C9, C11 and C14 telescopes are all designed with focal ratios in this range. When we opened the cardboard shipping box, we found our CE8SEOTA and the included accessories nestled between fitted foam blocks. The full length Vixen mounting rail and finder base were securely attached to the optical tube and the 25mm ocular, star diagonal and red dot finder were neatly packaged in small zip-lock bags. We should point out that this is not your father's "Celestron orange" telescope. We were pleased to find that this orange-bronze pearl finish is very attractive, probably the most stunning finish we have ever seen on any C8 telescope. In direct sunlight, it literally sparkles! The photo at the top of this page or, for that matter, the photos on the Celestron web site, do not do the NexStar OTA justice. They give the impression it has an orange enamel finish, but it is actually much more attractive. The Vixen quick detachable rail is our favorite scope to mount attachment system for telescopes the size of the C8. It is secure and easy to use, which is why it has become the de-facto standard in the industry. However, we noticed that there are no stop bolts in the C8's Vixen rail to prevent it from sliding out of the mating Vixen dovetail in a mounting system. This oversight should be corrected. Should the clamp screw securing the scope's rail in the mount's dovetail slightly loosen when the scope was aimed upward, the scope could drop to the ground. Make sure your mounting clamp stays tight! There are a couple of 1/4x20 holes drilled into aft part of the mounting rail, presumably to facilitate mounting the OTA on a heavy duty photo tripod if desired, so we screwed a couple of short 1/4x20 bolts into those holes to serve as stop bolts. Catadioptric (CAT) telescopes are relatively compact and SCT's are lightweight CAT's; that is the advantage of the thin, aspheric, Schmidt corrector lens compared to a thick Maksutov corrector lens. However, an 8" SCT is about the largest CAT we regard as truly portable. The Orion polyester/nylon padded soft case (#15191) we purchased for the C8 measures 21" long by 10" in diameter and the OTA itself is 17" long and weighs about 15 pounds with finder, rail and visual accessories. It is as heavy and bulky as we want to deal with in the field. In addition to some sort of case to protect the telescope in transit, many advanced users will want a correct image, right angle, optical finderscope. These can be had from Orion, Stellarview and other sources and are virtually a necessity for terrestrial use. A Vixen type finder scope mounting shoe (#07215) designed for the C8 and other SCT's can be ordered from Orion. In addition, we like to add a green laser pointer, such as the Celestron Laser Finderscope Kit. As we have written before, you cannot view objects you can't find, so we like to take advantage of all the available finder options. A handy accessory for those who wish to use their C8 as an all-around astronomical telescope is Celestron's f/6.3 Reducer-Corrector. This four-element, multi-coated optic screws directly to the rear cell and reduces the scope's effective prime focal length to 1280mm. It is quite useful for wider sky views of extensive objects, such as the Double Cluster and Andromeda Galaxy. Another worthwhile accessory is a solar filter, available from Celestron, Thousand Oaks Optical and other suppliers. These cover the front of the telescope (NEVER use an eyepiece sun filter!) and allow the telescope to be safely aimed directly at the sun, where sunspots and, depending on the viewing conditions, the granular surface of our nearest star can be seen. The C8 OTA comes with an E-Lux 25mm Plossl ocular that yields 81x magnification. This is a useful combination for many purposes. However, additional oculars are necessary to get the most out of this telescope. For astronomical observation, we would suggest the addition of (to stay with the Celestron brand) 40mm Omni Plossl (51x), 15mm Axiom LX (135x) and 8mm Ultima LX (254x) eyepieces as a practical minimum. Of course, similar oculars from other manufacturers (Tele Vue, Vixen, Burgess, etc.) would be equally suitable. A good 8-24mm zoom eyepiece (254x-85x) is also very handy. Fortunately, we had oculars from Celestron, Tele Vue and Burgess Optical in focal lengths from 5mm to 40mm available for this review. The star diagonal is retained in the visual back by a pair of fingertip set screws. Ditto for the way eyepieces are retained in the supplied star diagonal. These dual retaining screw systems are more secure than a single set screw, but twice as fussy. The best retention system is a compression ring tightened by a single fingertip set screw, particularly in the star diagonal, since oculars are changed frequently during a viewing session. Consequently, we used a 1.25" Astro-Tech dielectric mirror star diagonal with a compression ring for some of our viewing. This was a matter of convenience, not necessity, as the supplied Celestron prism star diagonal worked well. Astronomy and Photography Online staff members Jim Fleck, Rocky Hays, Gordon Landers and Chuck Hawks participated in this review. We started with some terrestrial viewing, which was hampered by the warm summer weather that created lots of rising air currents and heat waves. Then we moved on to some backyard astronomy. One of the improvements over earlier C8's, which we noticed immediately, is this C8's focuser. Like the focuser on the C6 we recently reviewed, this focuser operates smoothly and the backlash that plagues most SCT focusers has been substantially reduced. The C8's previously bare metal focusing knob now has a rubber covering that increases its diameter and improves its feel. The focuser still moves the primary mirror, but Celestron has apparently tightened the tolerances since we last owned a C8. There is even an anodized orange collar at the base of the focuser to make it easier to see. A C8 can provide intriguing views of terrestrial subjects if the atmospheric conditions permit. We used the C8 on a Stellarvue MG alt-azimuth mount to examine the needles and pine cones at the top of a tall fir tree at a laser verified 134 yards with a 40mm Celestron Plossl ocular (51x magnification). At one point a fly, clearly visible through the C8, happened to land on the branch we were looking at! A neighbor's weathered wood fence at 48 yards, particularly a chipped knot in the wood, was viewed through a 32mm Tele Vue Plossl (64x). This proved to be the most magnification we could use in the C8 on this particular day. Shorter oculars merely emphasized the heat waves, reducing the detail we could actually resolve. One convenient feature of the C8 is its close focusing capability, to around 20 feet, which easily exceeds that of most refracting and Newtonian astronomical telescopes. A C8 can provide fascinating "close-up" views of stinging insects, for example a wasps' nest, at a safe distance and without interfering with their normal routine. Of course, a C5 or C6 can do essentially the same things and are easier for most AZ mounts to support. The C8 and MG mount combination worked satisfactorily at low and medium magnification (using oculars from about 24mm focal length and longer) and the telescope's weight was not a problem. However, due to the C8's long focal length and potential for high magnification, we felt that the MG mount had reached its practical observing limit and the C8 was under-mounted for use with shorter focal length (high magnification) oculars. For nighttime use, we mounted the C8 OTA on a Vixen GPD-2 German equatorial mount. This excellent mounting system weighs about 31 pounds and is rated for 35 pound loads. It proved to be ideal for the C8. A quick initial star test revealed that the scope had been knocked slightly out of collimation during its journey from California to Oregon. It wasn't far out and, fortunately, the Celestron Owner's Manual provides simple, easy to understand and follow, collimation instructions. (The Owner's Manual is also available as a pdf file on the Celestron web site.) Collimation is best done by two people (it is not a group activity), one looking through the eyepiece while the other adjusts the colimation screws. If you follow the instructions exactly, it is a straightforward procedure. We used the C8 at night from Chuck's semi-rural backyard, where the light pollution is moderate and the Milky Way is faintly visible to dark adapted eyes, as well as from the suburban College Hill in Eugene, where the light pollution is more severe and the Milky Way is not visible. The prevailing seeing conditions were very marginal due to rising air currents, a thin haze and some high clouds. This limited the shortest focal length eyepiece we could practically use in the C8 to about 12mm (169x magnification at about 21 power/inch). However, we were able to get very impressive views of the quarter moon, aided by a moon filter, using an 8-24mm Tele Vue Click-Stop Zoom eyepiece set as short as 12mm and as long as 24mm, as well as with fixed focal length oculars of similar magnification. Because of its long focal length and consequent high magnification, a truly impressive amount of lunar detail can be seen. We looked briefly at the planet Venus, which was also in its "quarter" phase; no surface features are visible on Venus, of course, due to its 100% cloud cover. We also looked at a few of the brightest deep sky objects. The latter included the Andromeda Galaxy M31 using a 40mm Celestron Plossl and a 32mm Tele Vue Plossl with about equally good results. The Ring Nebula M57 could be discerned with oculars from 40mm to 12mm, with a 14mm Tele Vue Radian providing the optimum view. We were able to split the Double Double (double binary stars) in Lyra with 18mm, 14mm and 12mm Tele Vue Radians; ditto the double star Polaris. As usual, we used a bright 40mm Celestron Plossl to locate most of these objects in the night sky before switching to higher magnification oculars for more detailed examination, if appropriate. We have had quite a bit of experience with Celestron C8 telescopes and this one performed as expected. All of the good things you have read about C8's are true! The C8 really comes into its own at star parties and for serious astronomical observation at dark sky sites. It is, in fact, about the biggest telescope that we regard as truly portable, as it can be set-up on an adequate equatorial mount by one person, unassisted, in a reasonable amount of time. There are larger "portable" scopes available, to be sure, but they tend to either require detail disassembly for transportation (as per truss type optical tubes or multi-piece fork mounts), or come on simple Dobsonian alt-azimuth mounts that cannot track celestial objects across the night sky. Neither compromise seems worth the potential gain in light grasp to us. We prefer a C8 on a good German equatorial mount to any of the larger aperture alternative "portables" that we have tried. That includes Celestron's own C11 and C14 telescopes, which are spectacular for pier mounted home observatory use, but require too much effort to set-up to be truly portable, at least by our "single middle-aged person" standards. The C8 has the light grasp and focal length to see all of the planets (even Pluto, given ideal conditions, which we know because we have done it), as well as a staggering number of deep sky objects. These easily include the entire Messier catalog and hundreds of dimmer objects. Its resolution allows it to split a myriad of double stars. Since its limiting stellar magnitude is 14 and its Rayleigh resolution is 0.69 arcsec, the seeing conditions will normally be the factor controlling what objects can be viewed from semi-populated areas, not the telescope itself. Compared to smaller aperture scopes, the C8 is most impressive for viewing deep sky objects, such as the Whirlpool Galaxy M51, whose major arms can be discerned, and for peering deep into big globular clusters like M13 in Hercules. The latter is spectacular when seen through a C8. It has the light grasp to show deep sky details that smaller or less precisely figured telescopes cannot match. The view through a C8 under dark skies and good seeing conditions has always been, and remains, stunning. The modern Celestron C8 with Starbright XLT coatings, regardless of main tube color, is an excellent all-around telescope for the advanced amateur astronomer.